There is something about hand embroidery that is so relaxing! And decorating your home for Christmas with your creations, or giving them as gifts is budget friendly and very satisfying! Even if you are running out of time, I have some very simple Christmas embroidery patterns you can whip up in no time! Frame the finished product, or turn it into a pillow! 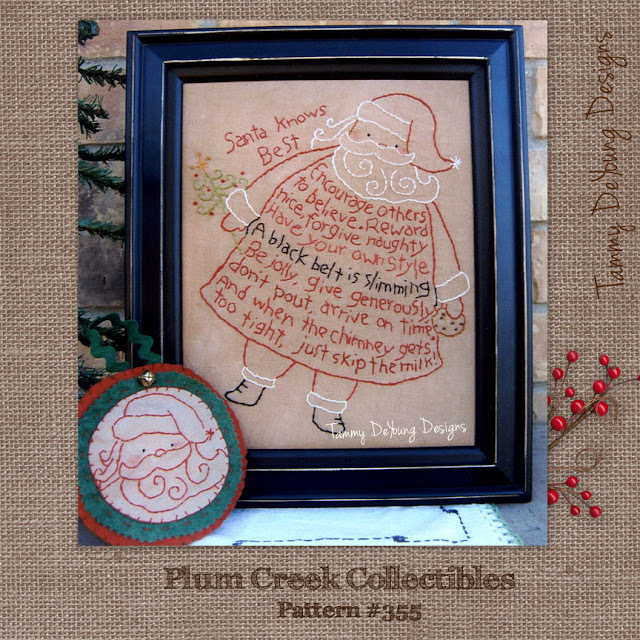 If you are a beginner, you might want to omit the words and just stitch the angel or Santa (below). It would still be lovely! Unfortunately, I don't have any step-by-step photos of this particular project, but watch my Tutorials page and I will post some helpful links to other tuts on the internet. Of course, you can use any variety of stitches you wish! First, you will trace the design onto your muslin with pencil or a disappearing marker. Insert fabric into hoop and start stitching! I have all the suggested colors noted for you but you can use whatever you like! Finishing touches: I like to take a red crayon and add some angel "cheeks" very lightly. I stitched a little cross charm to the angel below. Looking through my patterns, I realize how long it's been since I did any new stitching! I'm getting the itch to stitch again! Time to whip out my needle and floss! I tried Magnifico last night in my embroidery machine and it was a wonderful thread to work with. No breaks at all!Thanks for sharing these valuable information. This is genuinely an awesome read for me. I have bookmarked it and I am anticipating perusing new articles. Keep doing awesome! I came to your site and have analyzed your post. There are excellent details you posted here. Thanks for sharing Such a Great information with us , its totally related to my Studies , ill recommend to this information to others. Have a "Happy Birthday Jesus" Party for your Sunday School Children! Quick and Easy Valentine Party Games! Rainy Days on Mondays...make me wanna stitch!! Keeping the Kids Busy at Thanksgiving! The Tale of Two Stamping Friends!